March is a time of subtle seasonal changes. Despite it being the official start of autumn, it is ironic that we sometimes experience some of the hottest days here – in between some that are so chilly that one cannot help wondering if winter is being impatient! 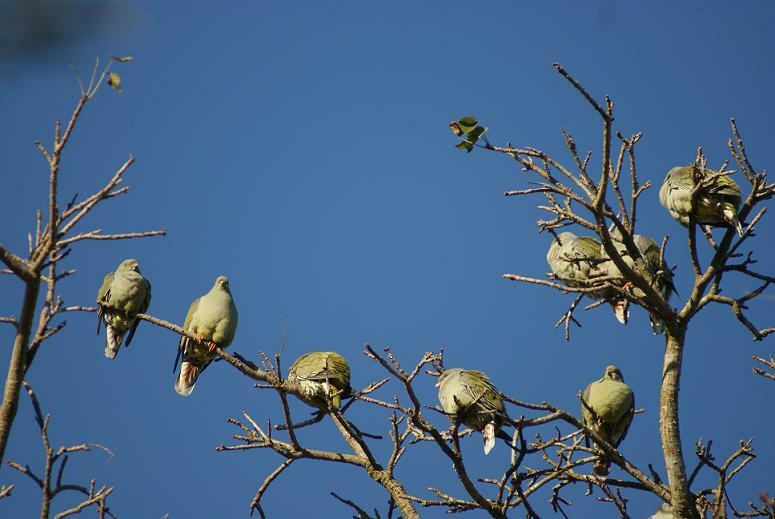 On one such morning I looked out of the window to see some African Green Pigeons catching the warmth of the early rays of the sun whilst perched in the top of the Erythrina caffra. 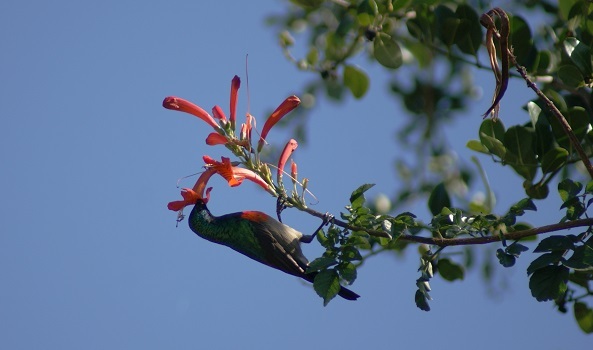 The evenings remain balmy and in the still night air we are regularly entertained by the comforting sound of Fiery-necked Nightjars along with the pinging noises made by the insectivorous bats that swoop all over the garden just after the sun sets. 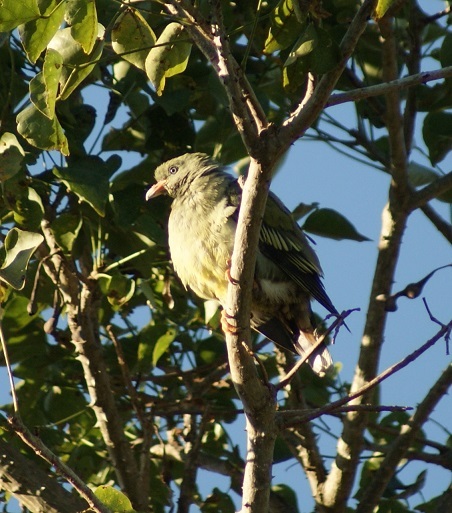 One morning I was sitting outdoors when the flock of doves swished into the air as one and disappeared in a flash – so did the weavers – and the Pintailed Whydah that had been pecking at seeds below the feeder. 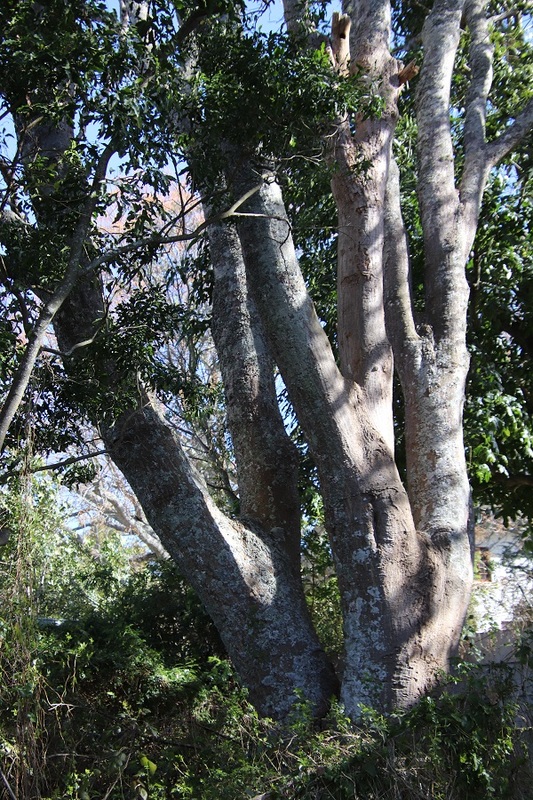 An eerie silence mantled the garden, leaving me baffled – until I saw a Eurasian Hobby alight from the fig tree and settle into the Cape Chestnut, where it stayed for some minutes. Within seconds of it flying off, the garden came alive again! 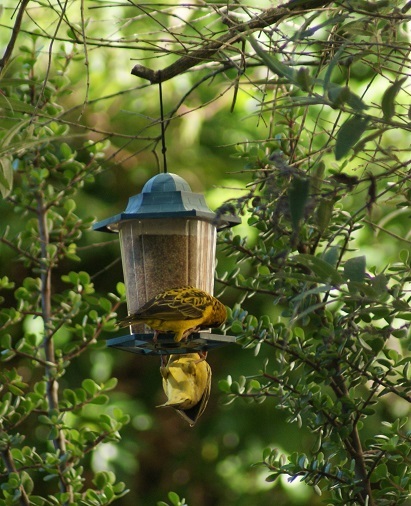 The Village Weavers continued to scatter seed from the feeder. 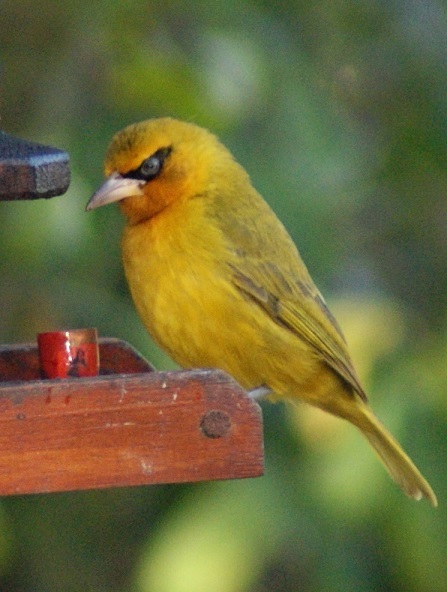 A Spectacled Weaver inspected the nectar feeder. A more cautious Redeyed Dove perched on a branch and observed the other birds feeding on the lawn for some time before deciding to join them. 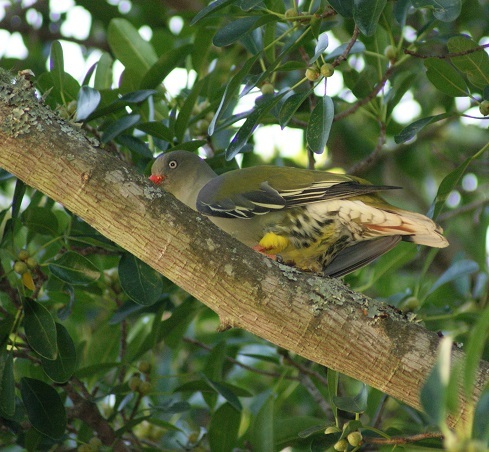 I first noticed African Green Pigeons (Treron calvus) in our garden in 2004, when a few of them were barely visible in the fig tree. It was only then that I realised that the odd croaks, wails and whinnying calls I had been hearing for a while was theirs. 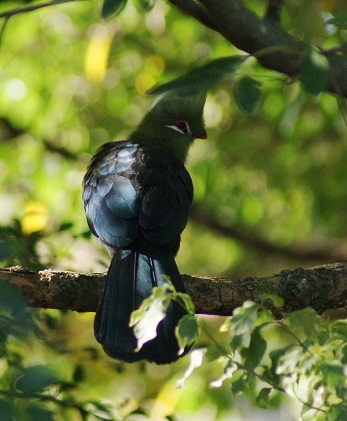 They mainly eat fruit and so are quite at home in the fig tree – yet, thanks to their cryptically coloured plumage that effectively camouflages them among the leaves, they are notoriously difficult to spot while they clamber around on the branches in the canopy of the tree. 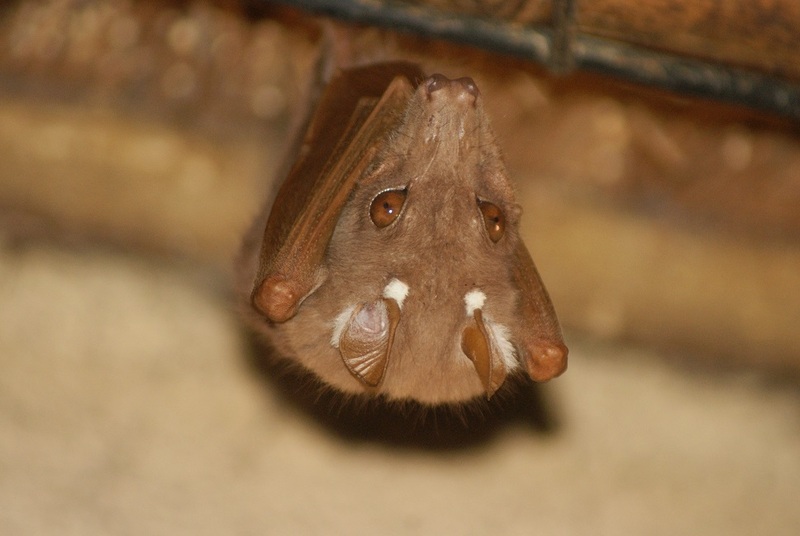 While they forage, they often hang upside down or flap their wings to keep their balance. 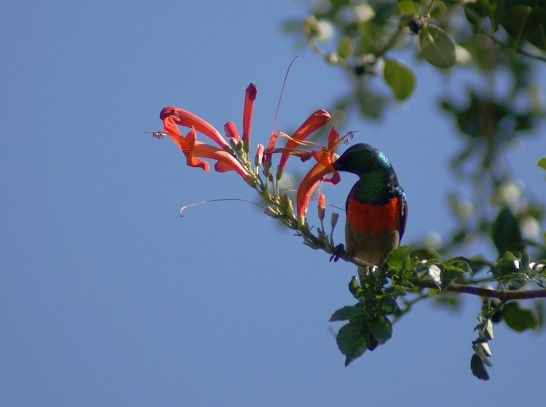 I have never seen one coming down to the ground in my garden, although I have spotted them on bushes almost at ground level in other parts of town – as well as in the Kruger National Park! 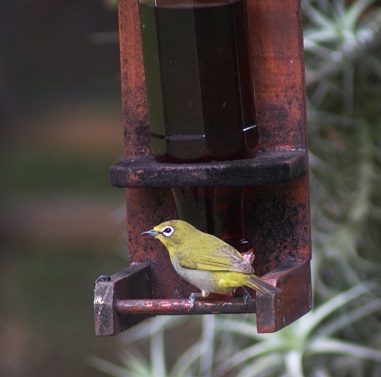 When they emerge from the foliage you can truly appreciate their beautiful colouring: the upperparts are greyish green to yellowish green and the thighs are yellow with mauve patches on the top of the wing. 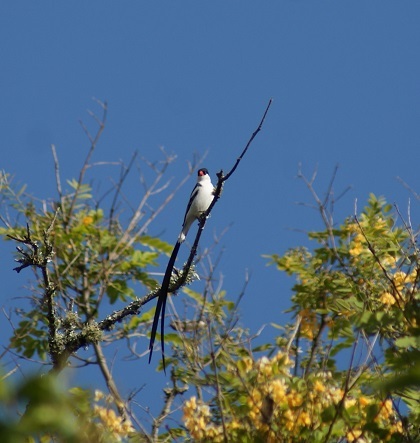 Their bills are whitish with a red cere. 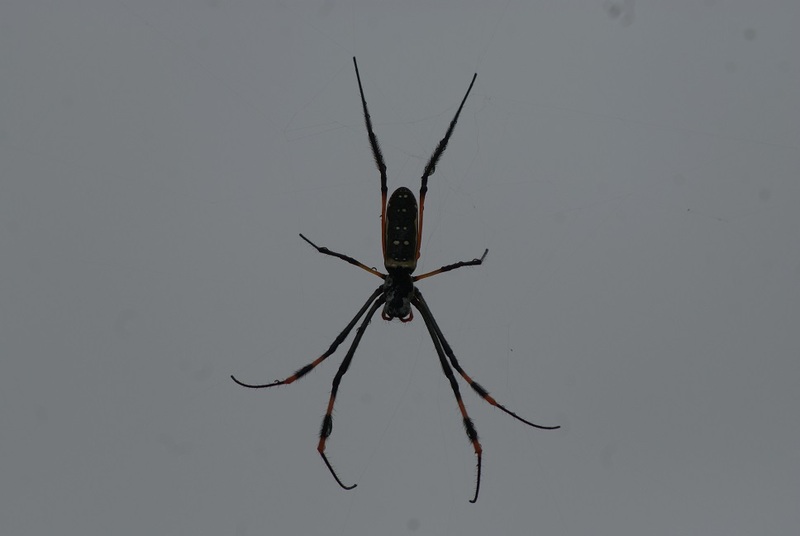 Their feet are also a reddish colour. I find their blue eyes to be most striking. They are gregarious birds and although I seldom see more than a few at a time, if there is a sudden loud noise (such as a large vehicle rumbling past) it is amazing to see well over thirty birds flying away from the tree at once! 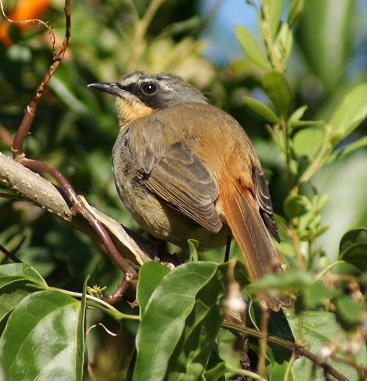 Their flight is fast and direct as they generally head towards the Erythrina trees at the back of the garden. 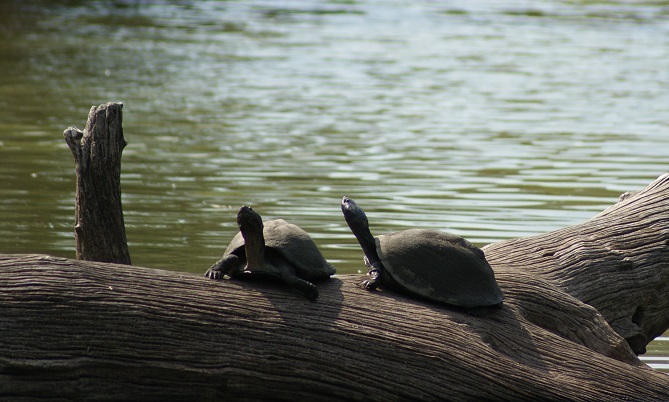 They can sometimes be seeing sunning themselves there on a chilly winter morning. 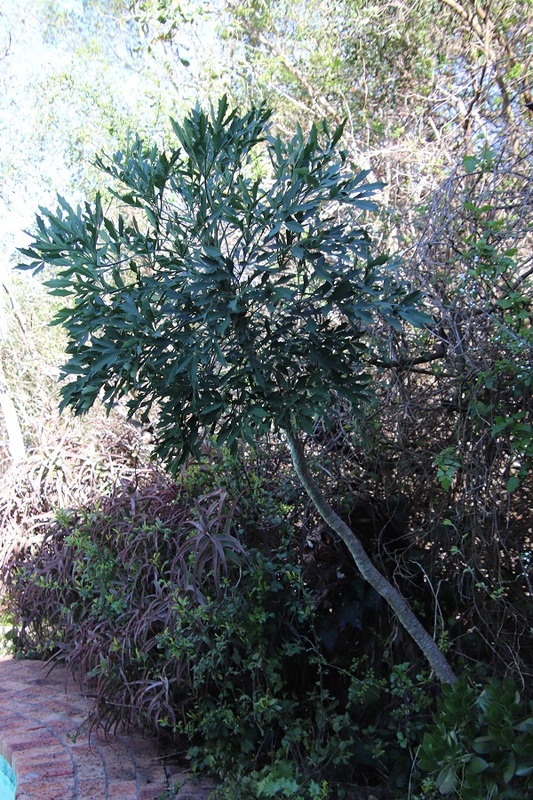 At this time of the year the sun seems to hang low above the horizon and hides behind the Natal Fig for longer than usual in the early mornings. As mentioned before, the front lawn remains in shade for much of the day and there is a discernible chill in the crisp, clear air. 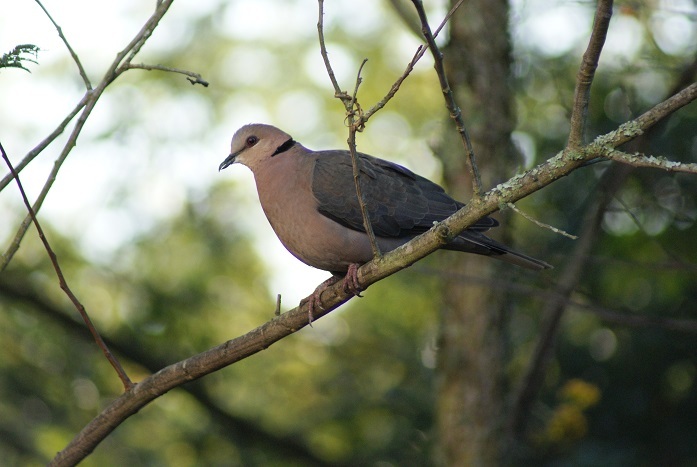 A flock of Laughing Doves weigh down the bare, spindly branches of the acacia tree as if waiting for the ground level of air to warm up before they venture down to pick up the scattered seeds. 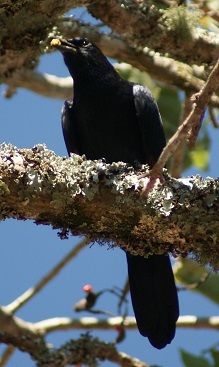 The first birds on my list this month, the Redwinged Starlings, do not have that problem. 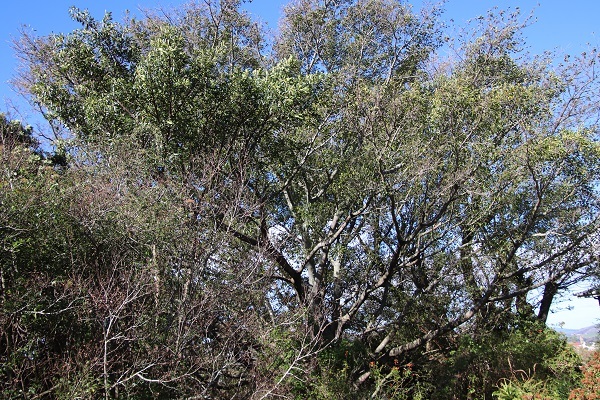 Dark, noisy clouds of them arrive daily to feed on the ripening figs, near the top of the tree shortly after sunrise and explore further down as the day warms up. 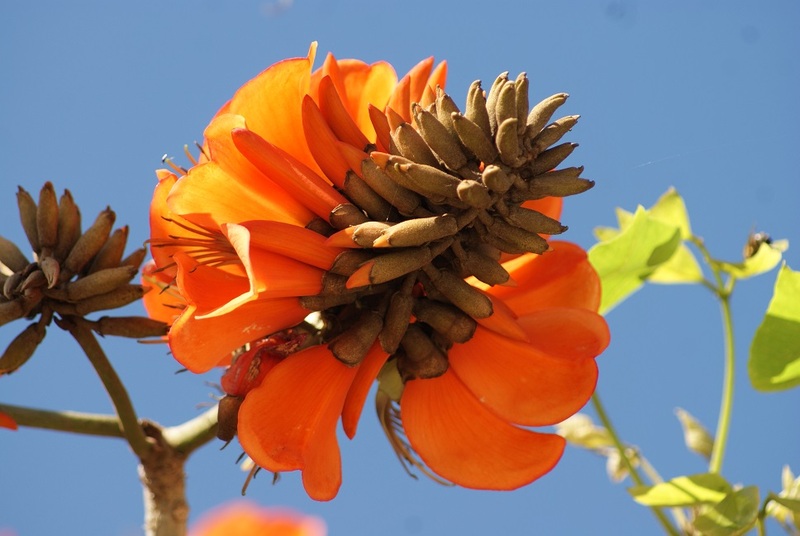 They also like to take figs across to the Erythrina tree, where they can eat in the sunshine. 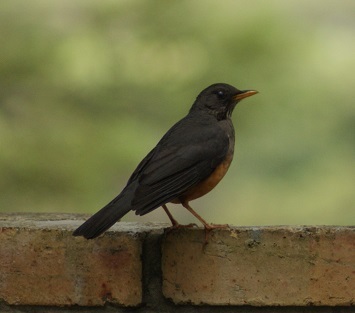 Olive Thrushes poke around to see what fruit and other morsels are available on the feeding tray, as do the Blackeyed Bulbuls. 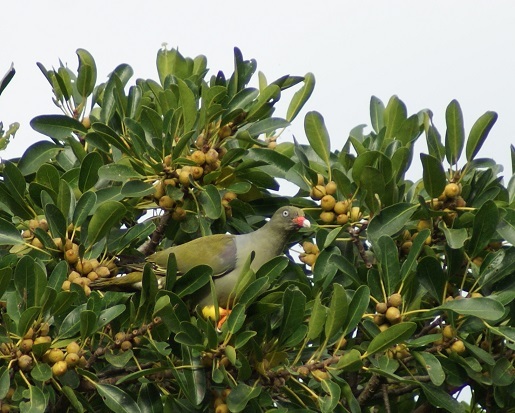 It is usually only when a particularly noisy vehicle passes on the road below the garden and frightens the birds that we can fully appreciate what a large flock of African Green Pigeons are camouflaged in the fig tree. They tend to be heard much more often than they are seen. I was pleased to hear first, and then see, a Cardinal Woodpecker the other day. 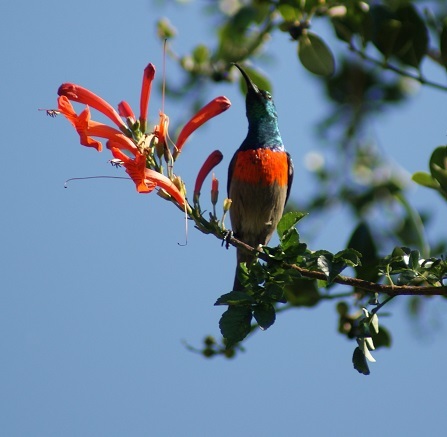 This morning a small flock of Redbilled Woodhoopoes cackled their way through the garden. Despite the cold, our winter garden is still cheered by yellow canary creeper blossoms lingering long after the main show of blooms have turned into white puffballs of seed; a variety of aloes are still attracting sunbirds; some blue Plumbago flowers are peeking through the greenery; and the lone Cape Chestnut blossom I mentioned last month continues to adorn the top of the tree. 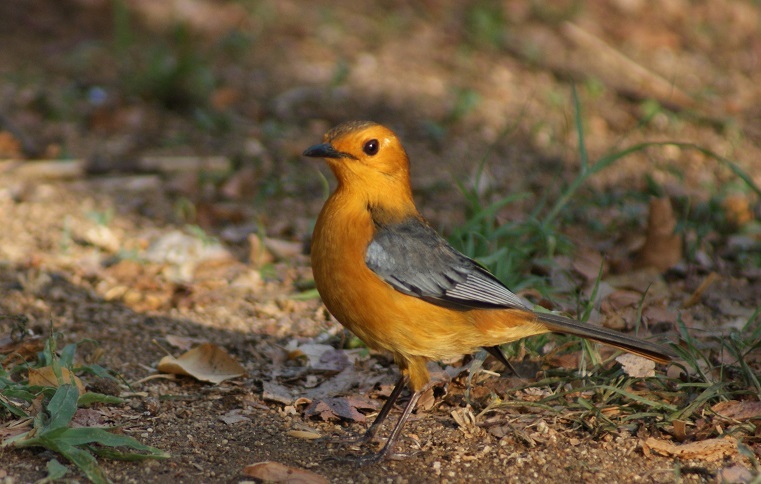 The Skukuza area proved to be a little disappointing after the bounty of game we had become accustomed to during our sojourn at Satara Camp. 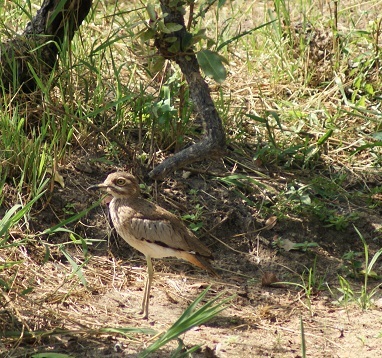 The vegetation is bushier, so the animals are not as easy to see, on some days the temperature peaked at 40°C, and – as happens periodically – perhaps luck was not always on our side. 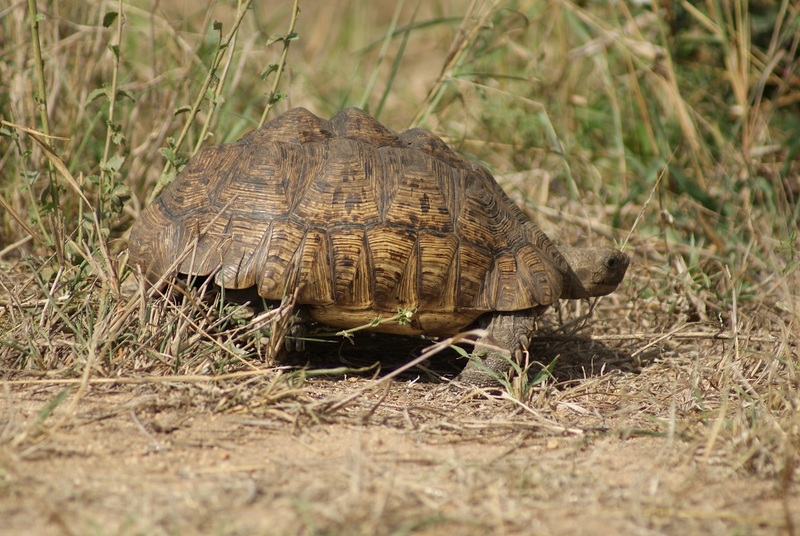 There is more to enjoy about a trip to a game reserve than spotting wild animals though. 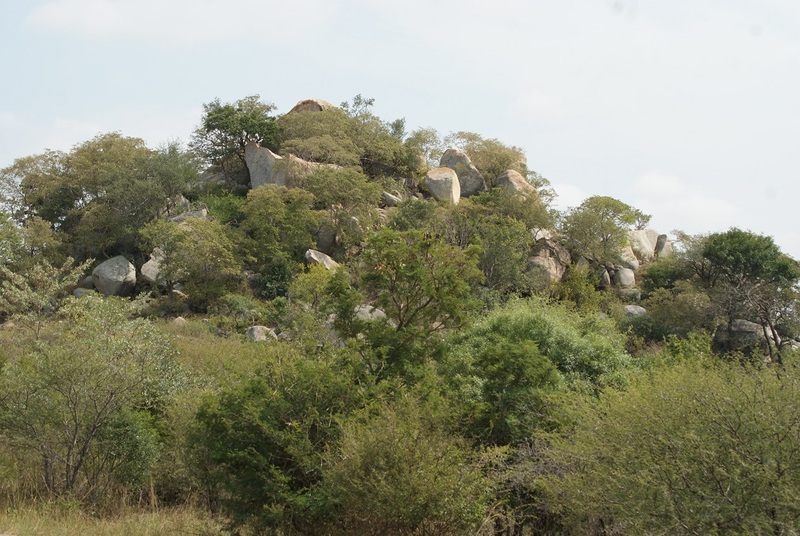 We revelled in the picturesque rocky outcrops. 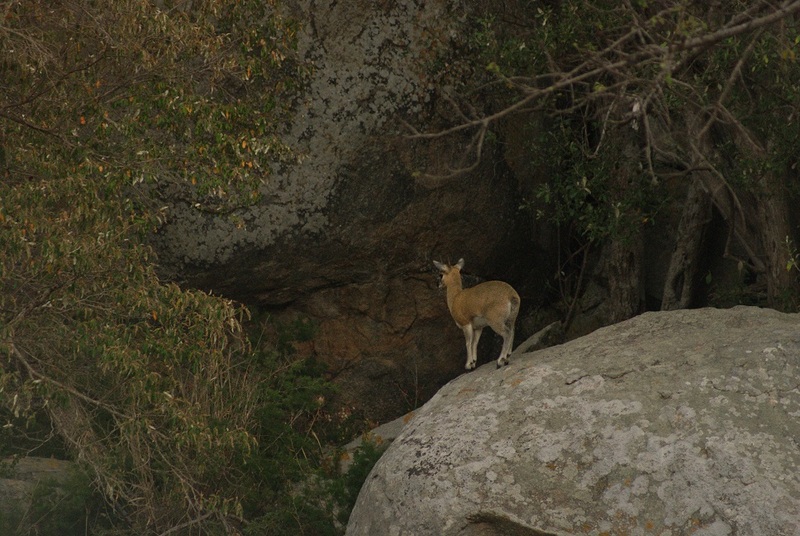 On one of them we saw a klipspringer surveying its kingdom. 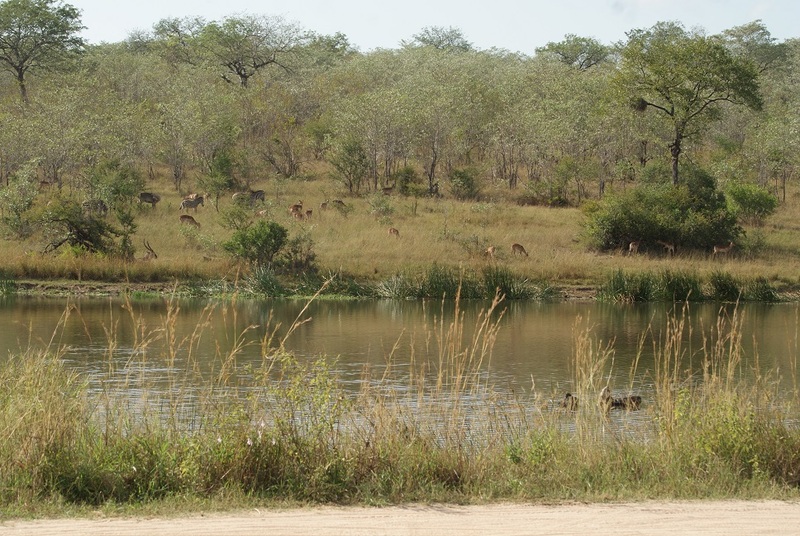 The multi-hued trees and waterholes, such as Transport Dam, are magnificent to behold. 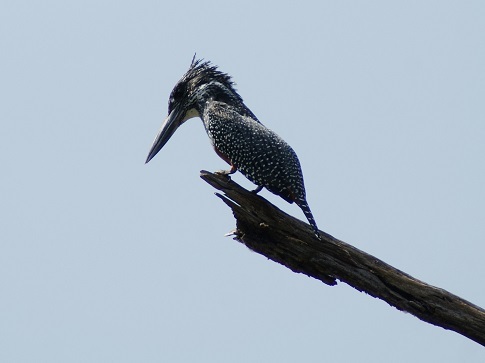 It was at the bird hide at Lake Panic that I was able to watch a Giant Kingfisher from close quarters. The Water Thick-knees were easier to see there too as they were so close in comparison to my previous sightings along river banks much further away. 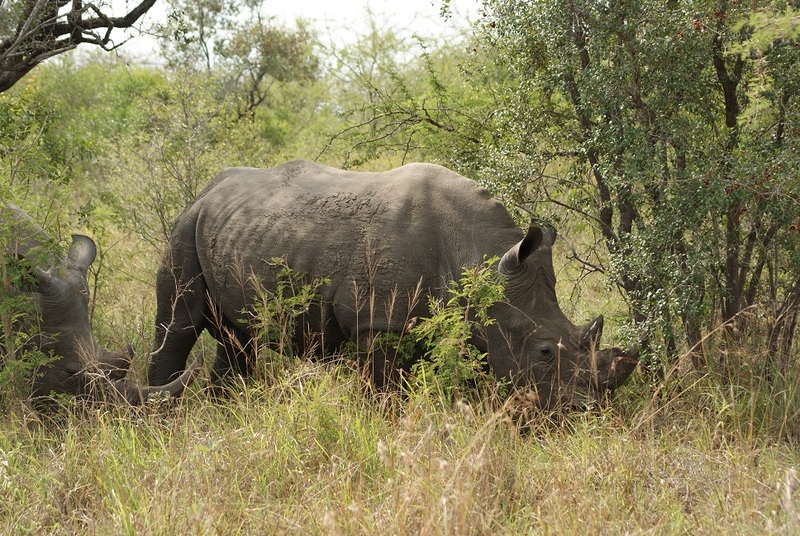 It was on a circular trip from Skukuza to Berg-en-Dal and back that we saw ten white rhinos in different locations. 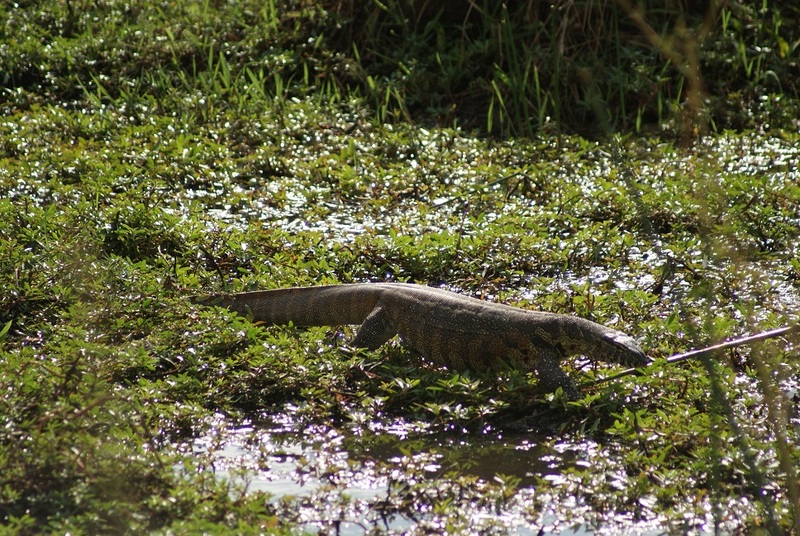 The waterhole at Berg-en-Dal attracted elephants and blue wildebeest while we were there as well as hosting at least one resident crocodile and several terrapins. 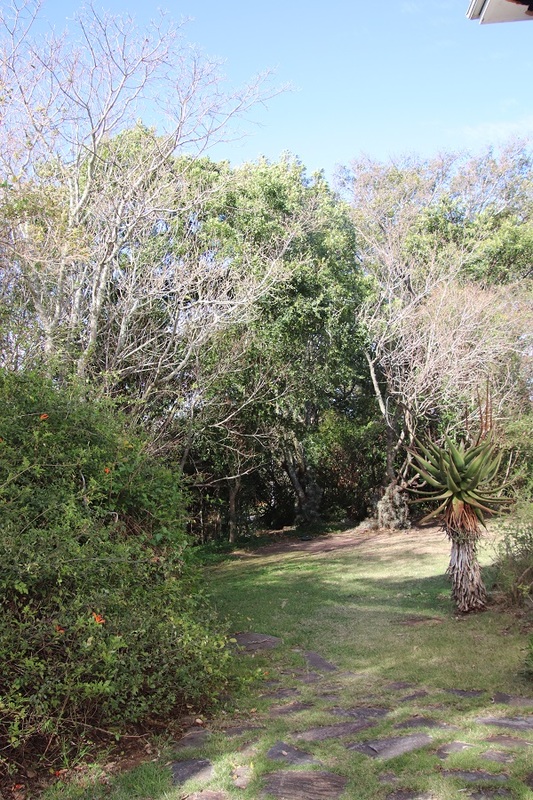 Picnic sites such as Tshokwane and Afsaal make good stopping points when embarking on a long drive. 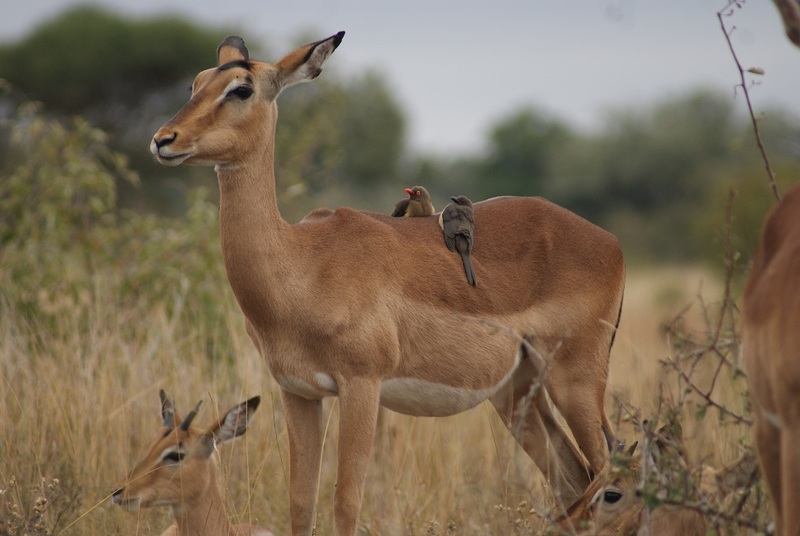 Both of these places appeared to have relatively tame bushbuck on the periphery – as well as the inevitable visits by vervet monkeys and baboons. 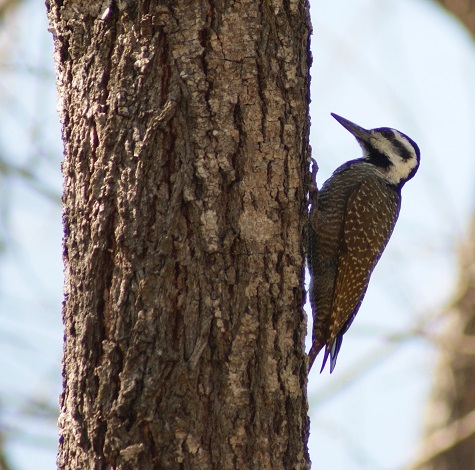 Bearded woodpeckers announced their presence with their tap-tapping on the bark of trees. 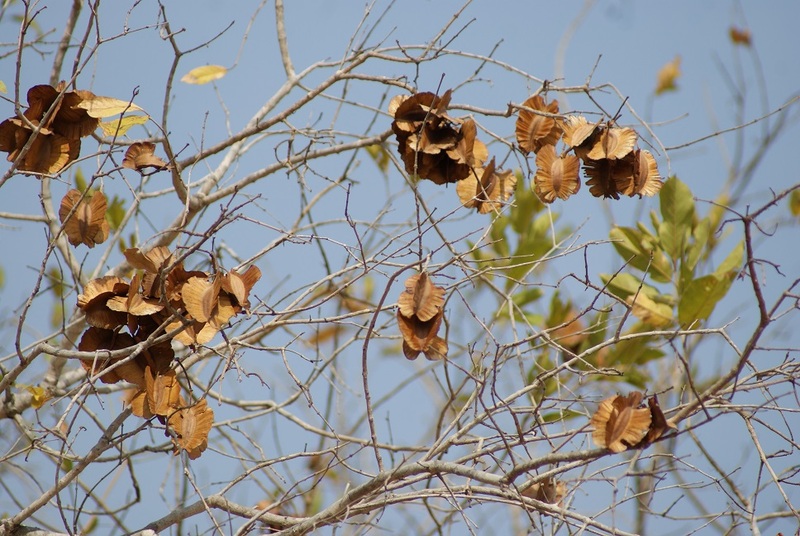 Having grown up in the Lowveld, I enjoyed being amongst trees so familiar from my youth: leadwood, appleleaf, jackalberry, and especially the kiaat trees. 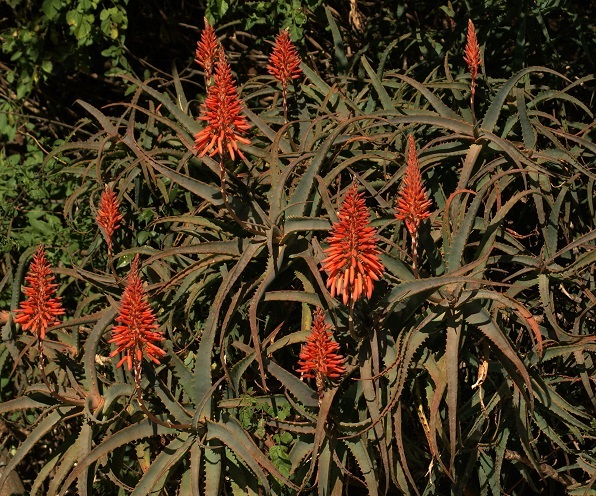 Their peculiarly shaped pods fascinated me as a child and the sight of them unlocked many fond memories from that time. 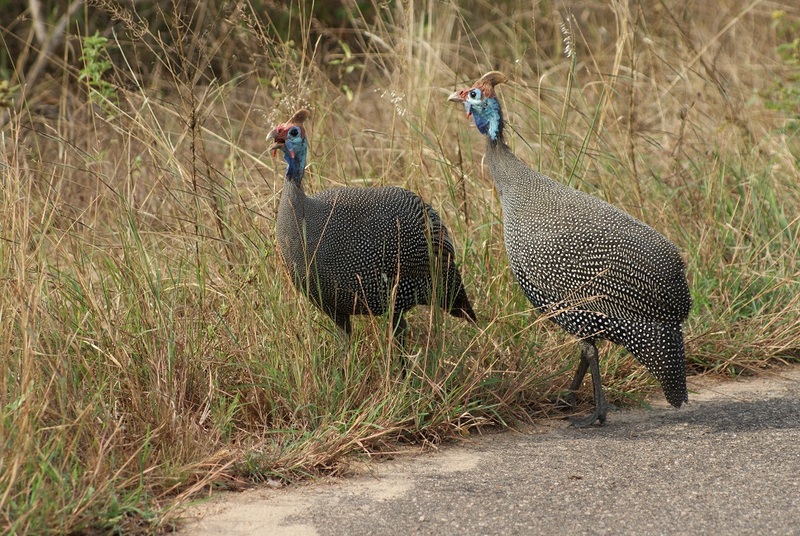 Helmeted Guineafowl and Blue Waxbills are birds that I grew up with. 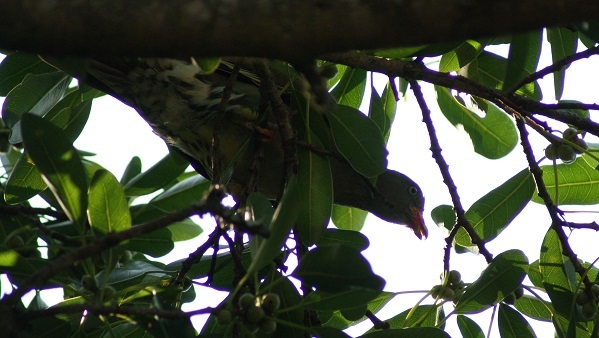 As I usually struggle to see the African Green Pigeons in the thick foliage of the fig tree in our garden, it was interesting so see them close by and out in the open for a change. 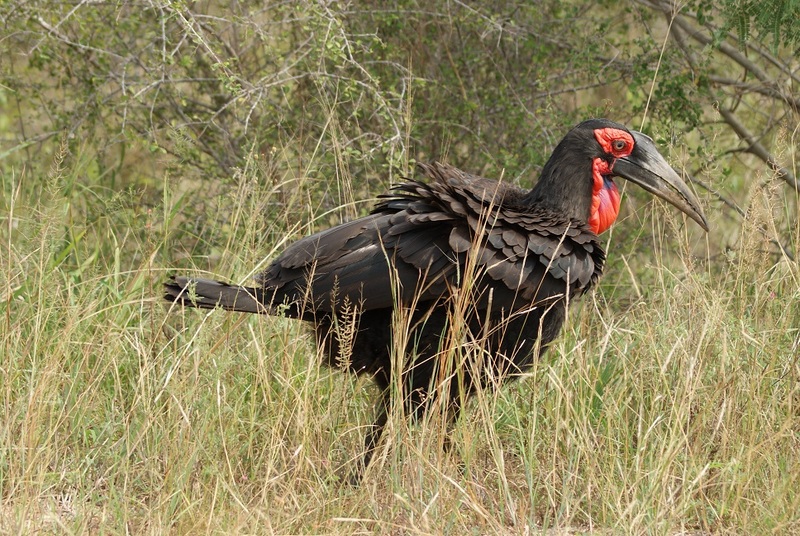 We saw more ground Hornbills in the Skukuza area than had been evident around Satara. 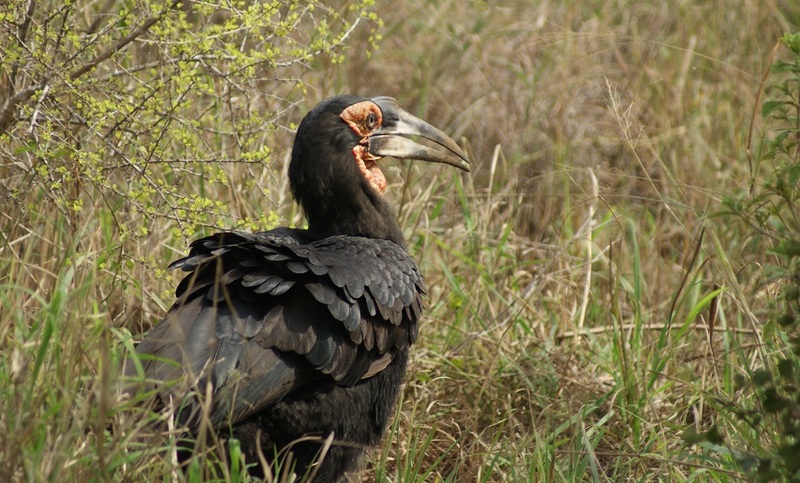 The largest group we came across included young ones in various stages of maturity. 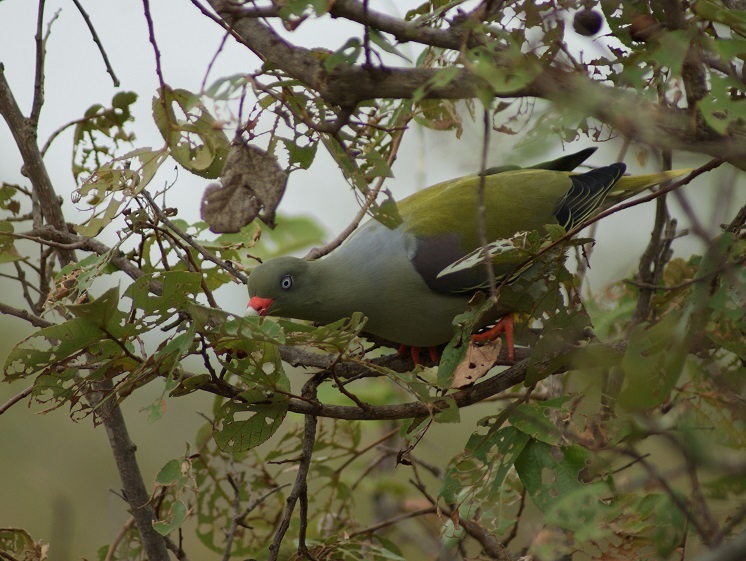 Although I have mentioned them before, it was good to see how prolific the Red-billed Oxpeckers were – always clearing their hosts of ticks with no place being too much trouble for them to ‘service’. Zebras are naturally photogenic. 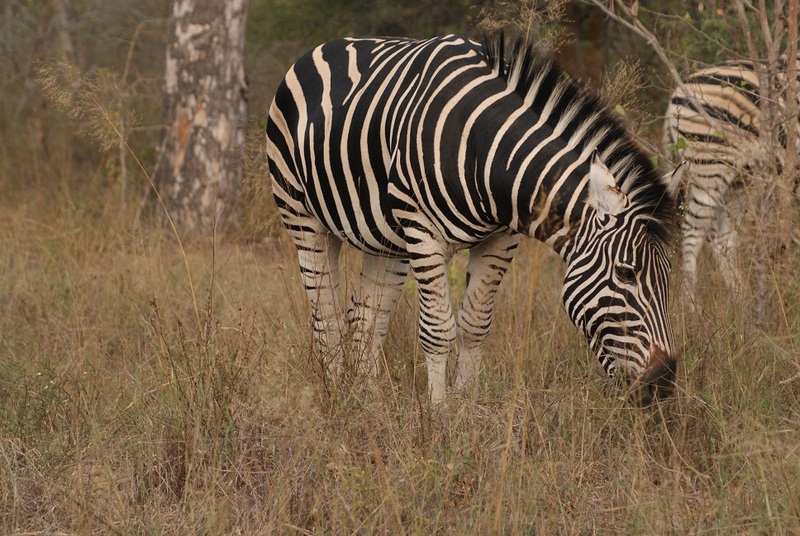 This one sports particularly dark stripes. 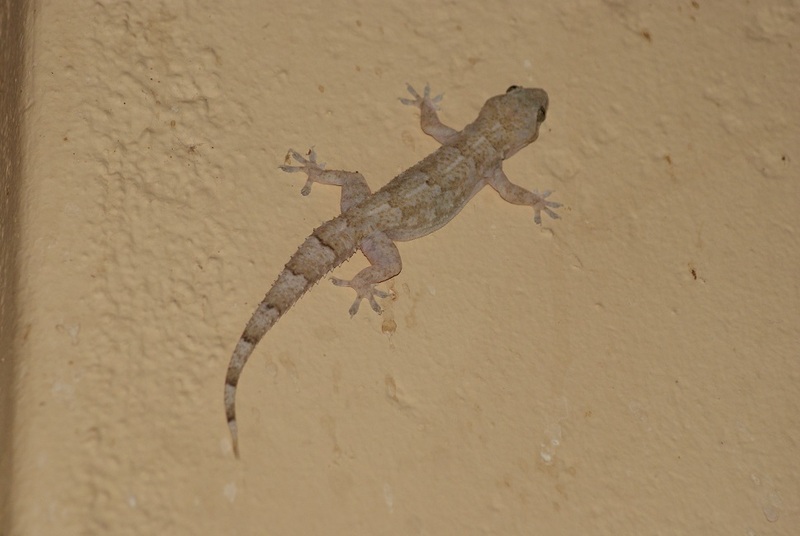 And the pale geckos that feasted on insects attracted to the lights outside the ablution blocks. 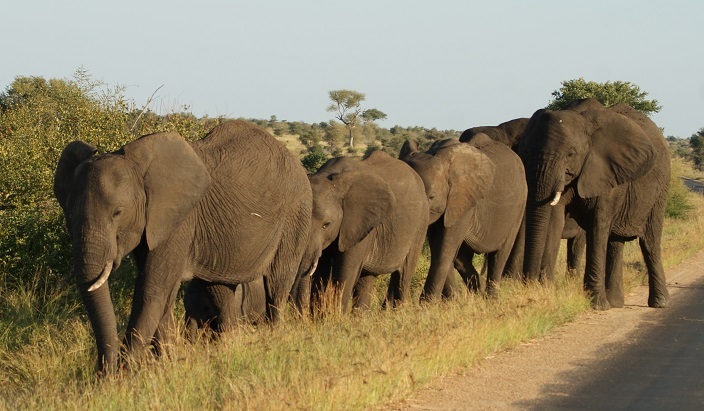 It was at Skukuza that I went on my first night-drive through the Kruger National Park. 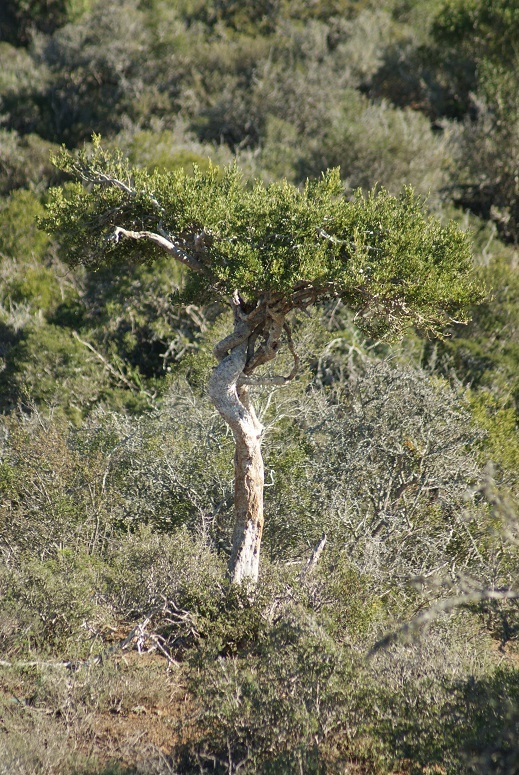 The spotlights showed up scrub hares, bush babies, a grey duiker and several spotted hyenas. The highlight for most visitors though was seeing three lionesses on a rock dome. They were so sated they could barely move so the multitude of camera flashes worried them not a bit. 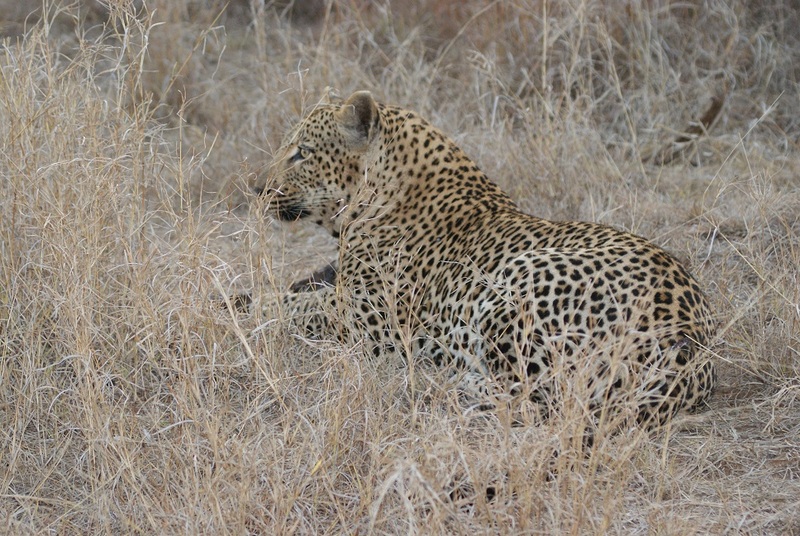 Having been on the lookout from day one, it was only on our way out of the Park that we eventually spotted a leopard lying in a dry riverbed far below the level of the road. The closely packed vehicles made it impossible to capture it in my viewfinder, so I will cheat by showing one we saw three years ago! 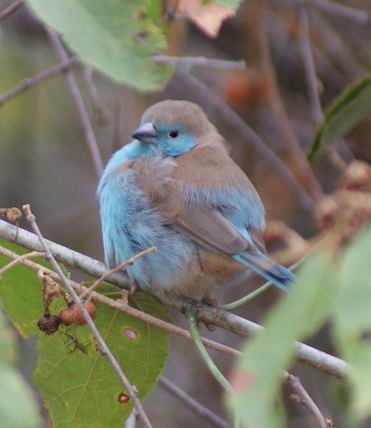 A morning spent at the camp afforded me the opportunity to observe some of the many birds that flitted through the thick foliage hedging our campsite. 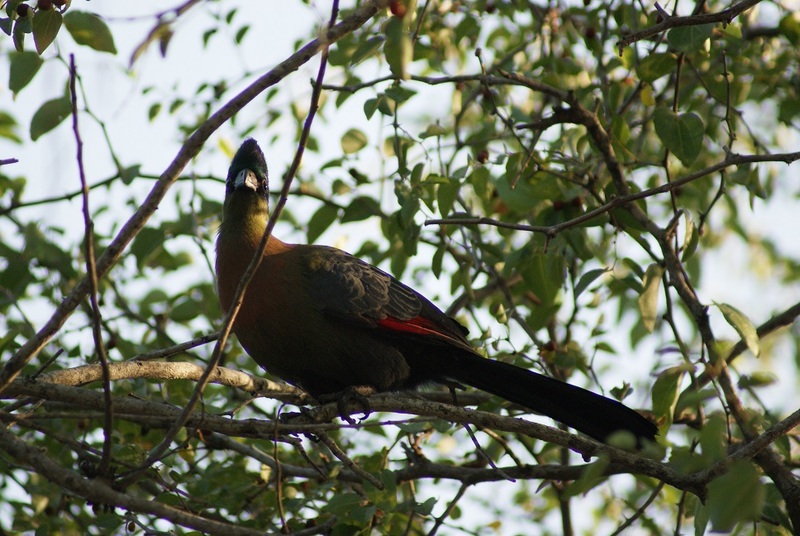 These included the rather raucous Purple Turaco and the very attractive Red-capped Robin Chat. 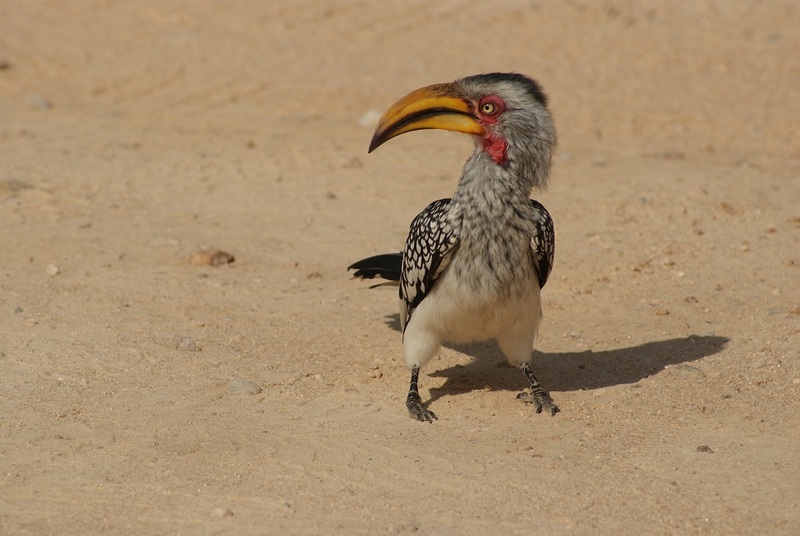 How can I leave the Kruger National Park without mentioning either that ubiquitous bird, the Yellow-billed Hornbill or the golden orb spiders!